Reference number for this case: 4-Oct-54-Castelfranc. Thank you for including this reference number in any correspondence with me regarding this case. 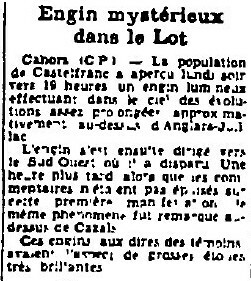 The regional newspaper La Dépêche du Midi for October 6, 1954, reported that the population of Castelfranc saw on October 4, 1954, in the evening around 7 p.m. a luminous machine performing quite prolonged maneuvers in the sky approximately above Anglars-Juillac. The "craft" then proceeded to the southwest where it disappeared. An hour later when the comments were not exhausted about this, the same phenomenon was noticed from Cazals, 15 km in the North of Castelfranc. According to the witnesses, it had looked like big bright stars, apparently in both cases. The sighting remained apparently unmentioned by ufologists. The meager description, the sighting direction and the sky map made me think the Catelfranc people probably saw Venus. Cahors (C.P.) -- The population of Castelfranc saw Monday evening around 7 p.m. a luminous machine performing in the sky quite prolonged maneuvers approximately above Anglars-Juillac. 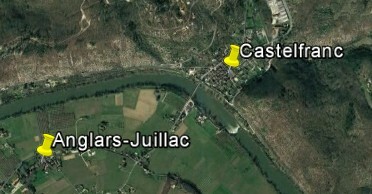 From Castelfranc, the direction towards Anglars-Juillac, which can not be very precise since the two villages are quite close and the precise location of the witnesses is unknown, the "craft" was at 270 ° to 220 °, or to the West-South-West or the South-West, direction in which the object reportedly disappeared. It happens that Venus was then at the azimuth of 230°, the low elevation of 4°, and went below the horizon at 07:37 p.m.. Although only 30.23% of its surface was lighted, its magnitude was a bright -5.5, because the Venus-Earth distance was only 68.84 million km. This makes it quite impossible to exclude that the people of Castelfranc simply saw Venus. We also had Mars at 173°, almost south, and a 19° elevation, setting down at 11:40 p.m., moving from south to southwest. Mars was well lit with 84.90% of its surface illuminated, but it was distant of 206.65 million km hence the low magnitude of -1.1. The Moon was at 188°, elevation of 19°.